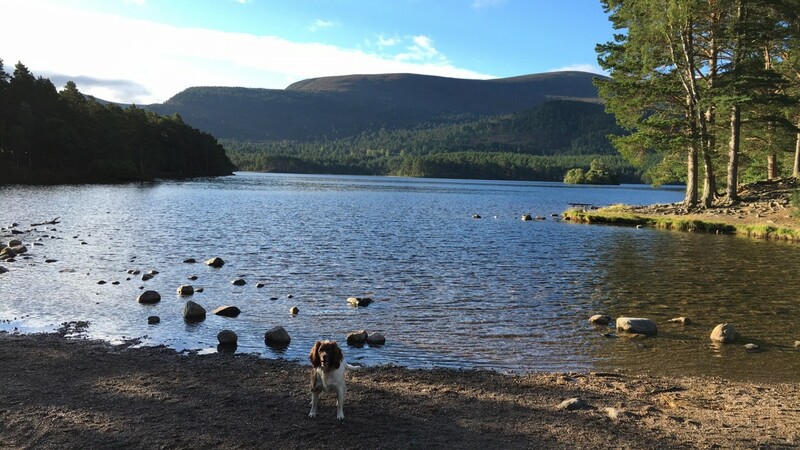 If you are looking for a dog walk in Aviemore, then at the top of the list needs to be Loch an Eilein, Rothiemurcus. 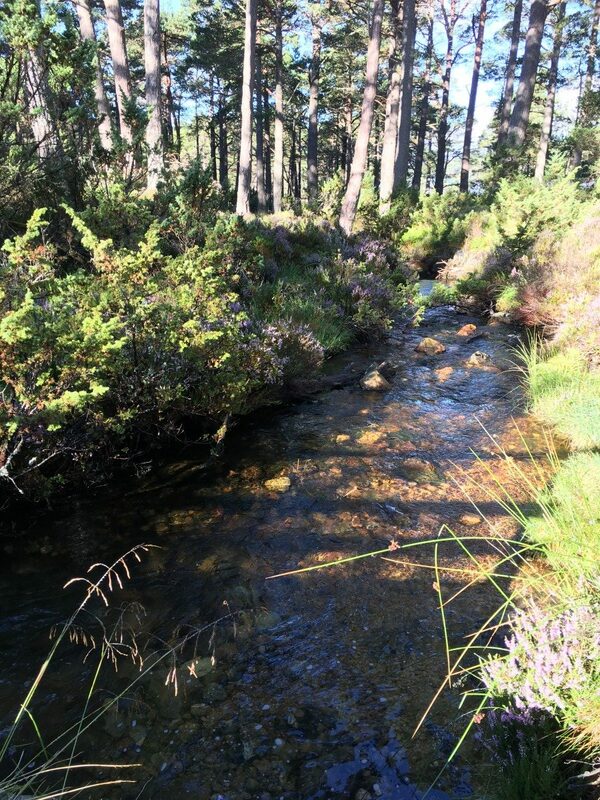 Stunning views across a sheet of water as you walk around the circular route, the gorgeous smell of the pines and purple heather and a ruined castle. What more can you ask for from a dog walk? 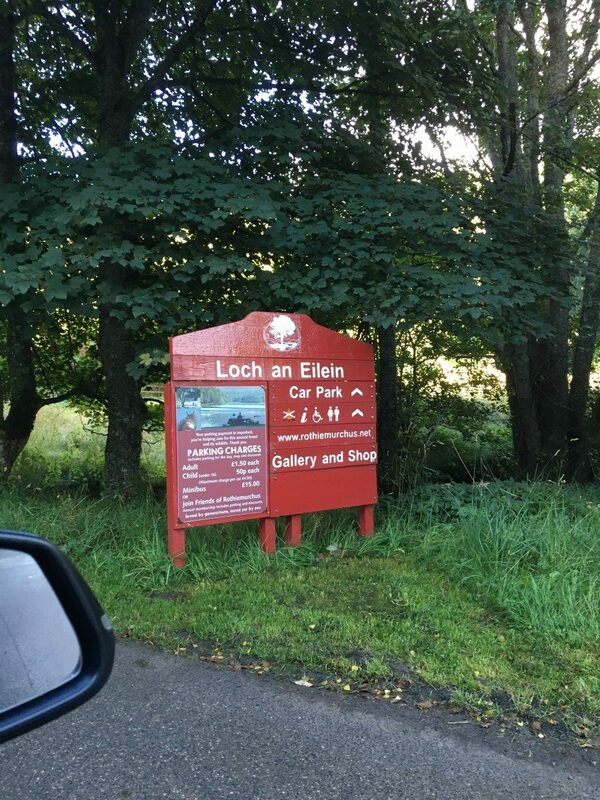 You’ll find the Loch an Eilein car park just a few miles outside the main road in Aviemore, 5 minutes by car. You take a left-hand turn opposite the Estate Farm Shop & Deli and The Druie Cafe. Both are a great stop on route back to refuel. Well signposted, you’ll find an attended car park just 2 miles from the main road. 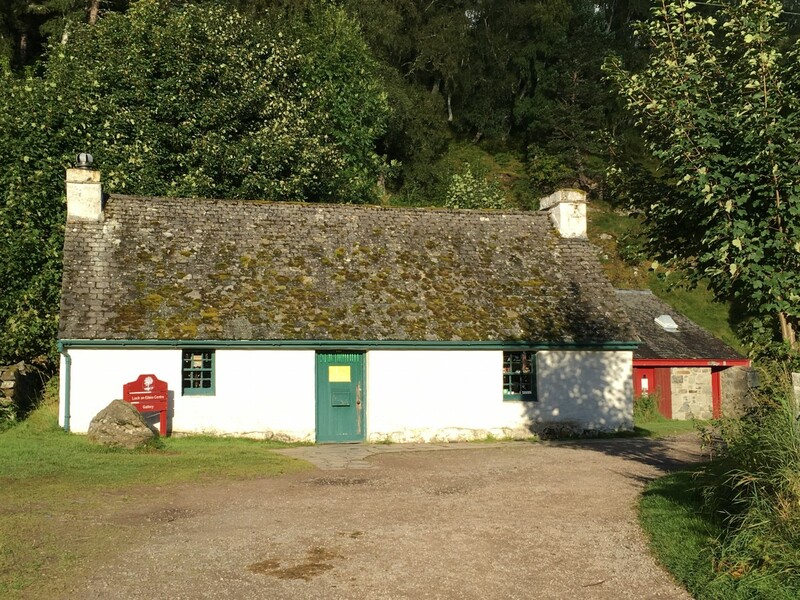 You’ll head south through the forest passing a toilet block on your left and a small gallery and shop. Whilst this wasn’t open for my early morning dog walk, the gallery house a wide range of fine art and locally made crafts. From Harris tweed, engraved and fused glass, it’s a great opportunity to see a range of artistic talents from the area. One to stop at on route back to the car. Translated from Gaelic as “Loch of the Island”, you can’t help be mesmerised by your surroundings as soon as you reach Loch an Eilein. There is a small bank down onto the water and you’ll get your first sight of the ruined castle out on it’s own island within the loch. 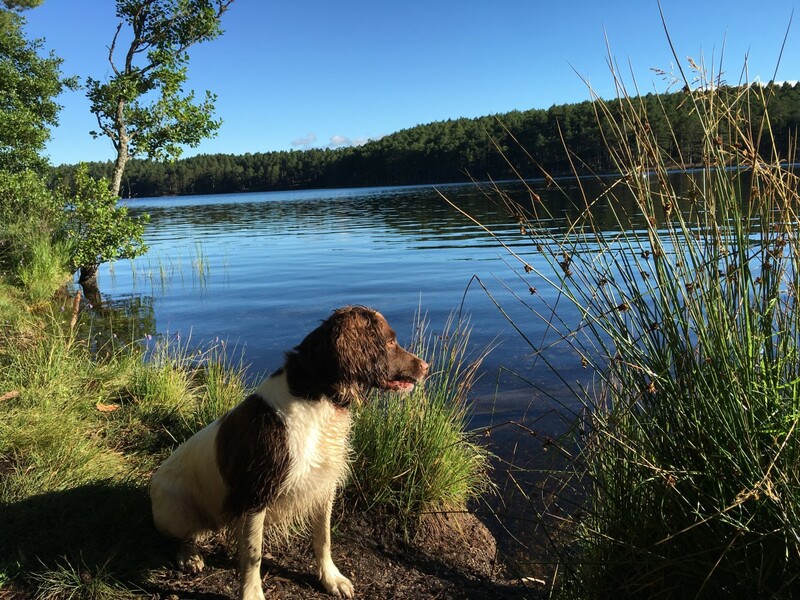 As you can imagine – Millie was now off the lead and expecting to her first dip into the water! I decided to walk around anticlockwise and was immediately distracted by the numerous opportunities for those photograph opportunities and surroundings. You can’t help but switch off as you walk around the loch and I felt extremely lucky, feeling that I had the whole place to myself and just 1 or 2 other runners and cyclists. If you’ve turned right at the bank as I did, just a few minutes from the start, you’ll spot the famous castle on your left-hand side with plenty of chances for a picture. Though you’ll spot that Millie is a little more interested in the ducks! During the rest of my walk, I was fortunate to spot red squirrels and a deer. Though you may also spot a wide variety of bird life including Osprey and Scotish Crossbill. The Scottish Heather was in full bloom and the forest felt like it was carpeted in stunning colours. You’ll find so much fauna and flora that catches your eye. You could easily add on a few hours to your walk, with a picnic and exploring some of the viewpoints around the loch. This will extend your walk by a further 30-45 minutes. Opting not to take the extended walk, I continued on around the Loch. 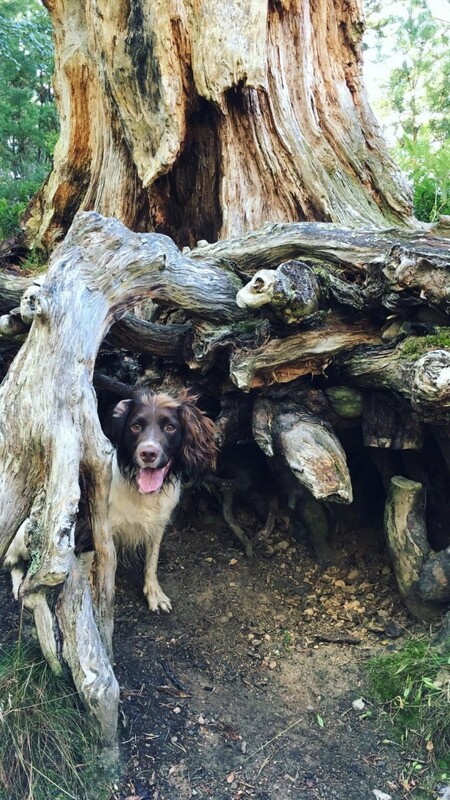 Whilst the route is mainly path based, there are lots of opportunities for your dog to bound around off lead away from the path. There are several sections of small streams for drinking and as a springer, Millie enjoyed bounded around in the heather. A couple of hours later, I found myself back at the start with one happy dog! You can’t help but feel refreshed and energised walking around in such stunning scenery. The next time, I must remember to take my DSLR camera. 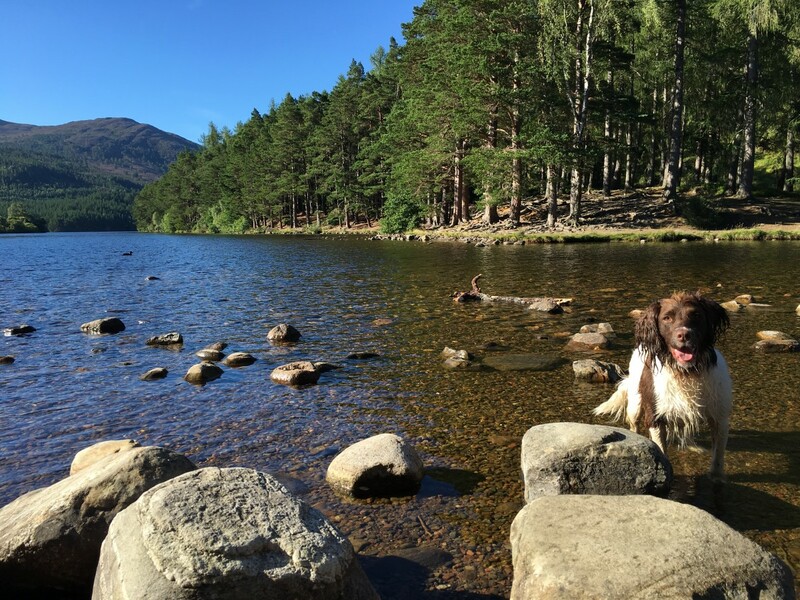 If you are visiting the Aviemore area, then I’d also recommend the amazing dog-friendly Craigellachie Nature Reserve. You can read all about our visit and find directions and details HERE. 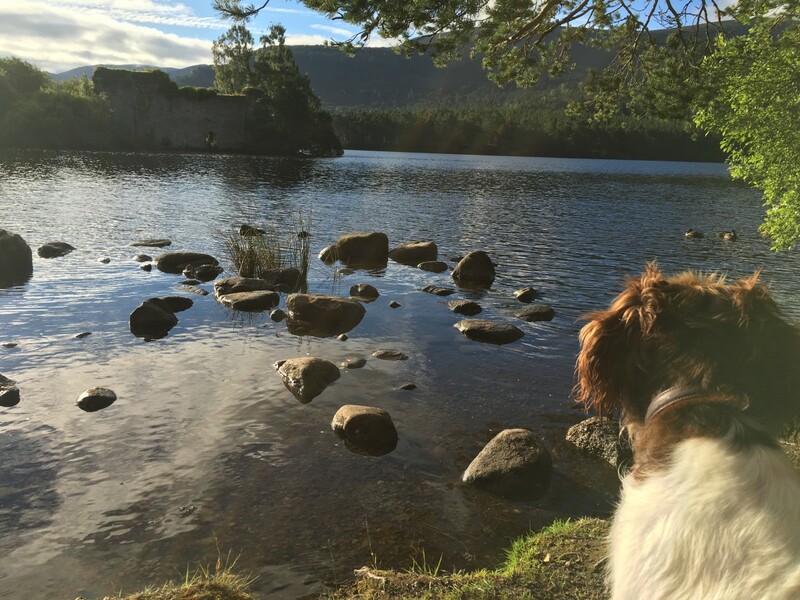 If you’d like to find out more about Loch an Eilein and its history? 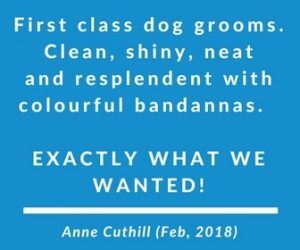 If so, pop over to the Rothiemurcus website HERE. You can also download and print a great online map HERE.